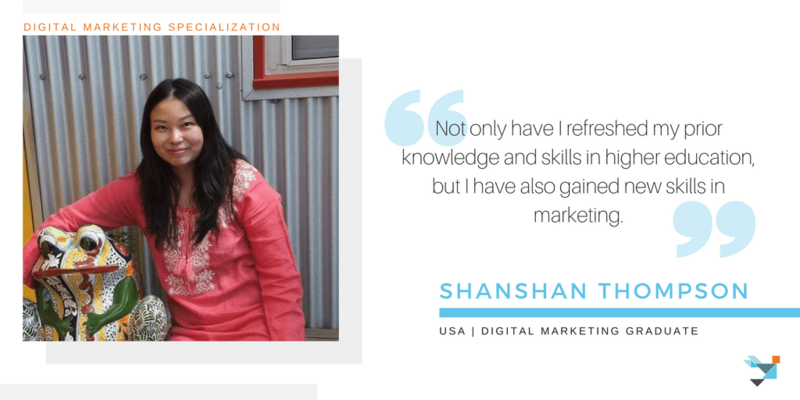 Thank for both the learning and working experience with the UIUC’s Digital Marketing team, not only have I refreshed my prior knowledge and skills in higher education, but I have also gained new skills in marketing. 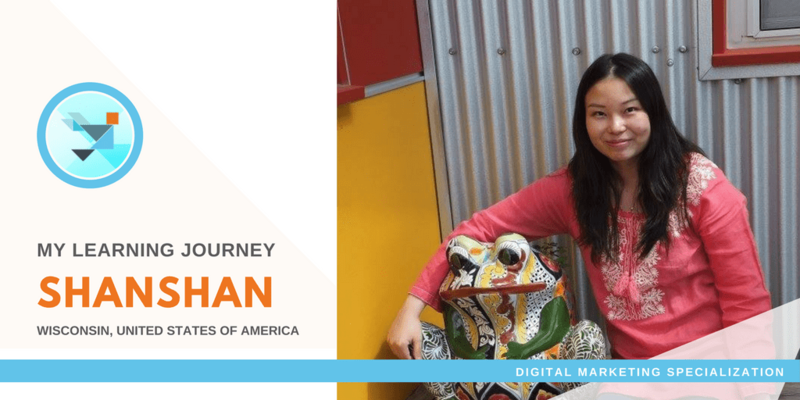 Before I moved to the United States in 2011, I was a full-time college admissions consultant and one of the co-founders who helped the company establish a well-known existence in my hometown (Wuhan, Hubei, China). After I settled in Platteville, Wisconsin, I couldn’t provide face-to-face service to the Chinese students, instead, I just kept the main founder informed of the higher education trends in the U.S. and gave timely constructive advice to help the company grow. Additionally, I became a new mom by the end of 2013. Due to these circumstances, I could only choose a more flexible studying method to keep myself up-to-date on the current trends. More importantly, my life experience taught me that it is not the people that we should keep up, it is the fast-changing society. In 2016, I started the Digital Marketing Specialization in order to have a smooth transition from prior career path to a new one – Marketing. Surprisingly, it turned out quite interesting and productive. First, I successfully finished the specialization; then due to my active participation with the team online, I was honored to become part of the community ambassador team, working with wonderful teammates Manuel Feldman, Mark Benson, Natalie Papazian, and course creator Professor Aric Rindfleisch and Professor Vishal Sachdev. The reasons why the Digital Marketing Specialization caught my eyes are simple. They have charming and hardworking faculties, useful and up-to-date content, demonstration of gaining the skillset in the business world; and the message they are delivering: democratizing the higher education, reforming the complex structure of the higher education, being the disruption pioneer of the higher education. What amazed me the most are the companies they collaborate with since those companies are also innovation leaders from their own industries. Getting people from various organizations to work together is not an easy thing. By doing so, the Digital Marketing Specialization faculties also demonstrate strong persuasion skill, which is also an essential skill for business students to learn. After I finished the specialization, I closely engaged in online conversations with the teaching faculties and actively helped promote the brand awareness of the University of Illinois’ online specializations after being recruited as an Illinois Community Ambassador to the Digital Marketing Specialization. I currently serve as a mentor on Coursera too, which hone my skills of giving effective feedback to online learners. I deepen my knowledge on the concepts such as self-determination theory, motivation of online learners, working with learners without prior knowledge of course material, combatting low completion rates, and strategies to improve online learning environments. By taking the 3D Printing Specialization, I share my experience as a learner without prior knowledge of 3D Printing to Professor Vishal Sachdev and provide specific feedback about the areas he can improve on to help learners like me to learn better. Moreover, I can always get immediate response from him since I can reach him even on weekends. In the business world, it is very important, because when an issue appears, we need to think fast, react fast, and respond fast to solve problems. Through moderating the online book club, I continuously have positive interactions with learners around the world. Additionally, helping to organize and host twitter chats for the Digital Marketing Specialization has put my newly gained knowledge into practice. Since my work with the university is completed online, it exercises my leadership skills such as self-control, interpersonal communication, project management and working effectively. Offline, I apply this integrated skill set to help promote the Southwest Area Toastmasters, a local community organization as the VP for Public Relations. Considering the knowledge that I still lack for the future job I want to get in addition to how much the University of Illinois’ courses benefitted me, I started the university’s Financial Management Specialization two months ago. It is one of the prerequisites to the iMBA. It immediately gave me a taste of the intensive teaching of an MBA course. I realized that in order to survive those courses, solving the problem is not enough, using the most effective way to solve it is crucial. Efficiency is the king. Learning and working in the field of online education, I understand that there is still plenty of room to grow, disrupt, and innovate. Being part of the changing process, and being a person who can contribute to it, has provided me with a sense of accomplishment. How has the Digital Marketing specialization helped you succeed in your career? Let us know at cobcourserastaff@gmail.com!